The mural took over two weeks to complete working from an initial design - which was bounced between Los Angeles, Edinburgh, Paris and London - and was commissioned by the hotel's owner and The Narrative. 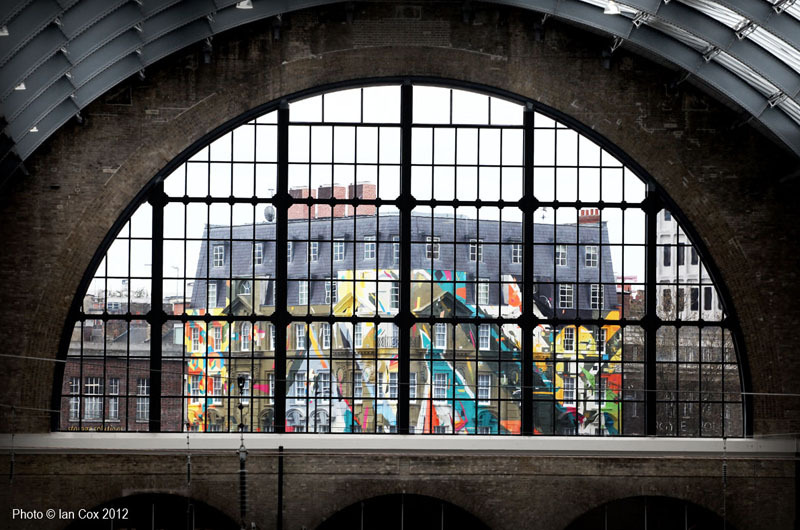 From a design perspective the artists collaborated to create a single work that would utilise their different styles and perspectives to create a modern mural that integrates with the surrounding area, and emphasises Kings Cross’ status as a major gateway for international and national visitors alike. The influence of the mural continues inside the building with a permanent collection of artworks created for the restaurant and a one of a kind reception interior designed and executed by AoC for the attatched hotel. The challenge was to create a mural that would at once enhance the complex multifaceted character of the grand Georgian building and reflect the strong modern geometry in the artists work.